eCheck is a method of making deposits into and withdrawals from online casino accounts by using virtual checks which are connected directly to a user’s bank account. 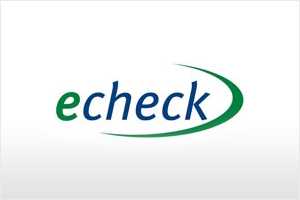 The eCheck service is free due to the fact there is no middle company used to transfer your money and the funds move directly from your account straight into the casino account. It is also incredibly simple but it does come with the drawback of having to submit a number of bank details online which many customers may not feel comfortable about. With eCheck, a user does not have to sign up to a website to get started. If you are a member of a casino that supports eCheck, simply go to the cashier section of the site and choose eCheck as the payment method. The user must then enter their bank details and essentially a virtual check is written online which is transferred directly to the casino, ensuring that the transaction is instant and the funds are immediately available to play with. The same process works when withdrawing cash. If the user has previously deposited money using eCheck, they are then free to withdraw using eCheck, simplifying the withdrawal process as the funds are transferred directly into the user’s bank account. Many casinos support eCheck and it is becoming massively popular due to the fact it is free to deposit money. Some people do not want to hand over their details online and this is perfectly understandable. However, it should be noted that these details are security encrypted and customers should feel safe using eCheck because the best fraud prevention measures are in place. Provided that that your preferred casinos support eCheck, it truly is one of the simplest and most cost effective ways to deposit and withdraw money online.